Does your dog have anxiety and fear? Give them a hug! in which she creates a “squeeze machine” to give herself comforting hugs? Decrease release of cortisol, a stress hormone — University of Miami researchers have published numerous studies backing the benefits of the human touch. They found it can do things like lower the output of the stress hormone cortisol and cause a surge of “feel good” brain chemicals. The author initially conceived of the idea for the squeeze machine from her observations in animal science. 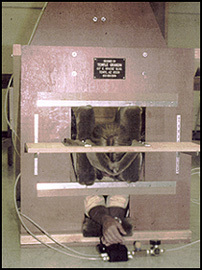 Cattle being held in a squeeze chute, while waiting in line for veterinary attention, often appeared somewhat agitated during the waiting; some of the animals, however, seemed to relax once pressure was applied to large areas of their bodies. The Anxiety Wrap for dogs calms anxiety and fear with a “healthy hug”. The Original Anxiety Wrap is the most effective way to end fear of thunder, fireworks, separation anxiety, travel anxiety, barking and much more. Using Maintained Pressure and Acupressure to relieve stress and end or lessen multiple fears and anxieties in dogs and cats worldwide. Created and patented by Susan Sharpe, CPDT KA in 2001, it was the first of its kind and invented the entire Pressure Wrap category. It’s the only patented pressure wrap in the industry and comes with a 100% satisfaction guarantee. Free online support from one of our professional dog trainers is provided with every purchase. 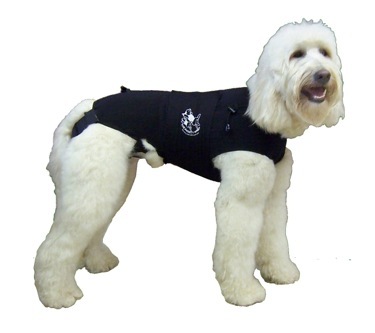 The Original Anxiety Wrap ends fear of thunder, storms, fireworks, dogs, people, guns, travel anxiety, separation anxiety, fear of other dogs, nervousness and can also be worn comfortably under harnesses, apparel, during agility practice and in water therapy during rehabilitation. Nicolas Dodman of Tufts University completed an independent scientific study with the results of the Original Anxiety Wrap being 89% effective for dogs with thunderstorm fear. According to Dr. Roger Mugford, Pet Psychologist and Founder of The Company of Animals, “Fear and anxiety are at the root of many canine behavioral problems.” Unaddressed, these fears can result in aggressiveness, leash pulling, separation anxiety, excessive barking, and hyperactivity. “We’ve been using and recommending the Anxiety Wrap in The Company of Animals’ own British Behaviour Centre for years,” continues Mugford. I have six dogs, three of which are one-year-old pups. They are large akitas, yet two of these pups are very skittish. They often pee when a stranger or even a neighbor tries to pet them. One of them is so anxious she constantly barks whenever anyone comes over. We did not socialize these pups enough when they were younger. I am hoping they outgrow this anxiety and fear, but in the mean time, I plan to try the Anxiety Wrap. Thankfully, they come in the XXL size. Ironically, my pups are not afraid of bears. Humans are another story. Even when my neighbor tried to give my girl a treat, she piddled on the ground. The Anxiety Wrap is just what we need! The fabric is soft, lightweight, and breathable, so it can be used in warm weather. It is only dog wrap that activates acupressure points. It is machine washable on the delicate setting. The Anxiety Wrap comes with a detailed direction pamphlet with suggested schedules and tips for treating specific fears and anxieties. Unfortunately, I cannot find any eco-friendly attributes for this product.